PARIS, FRANCE—(Marketwired – Dec 15, 2014) – Visitors to Paris don't have to stand in line at the Louvre to see compelling artworks this season. Thanks to the new RLife event series at the Renaissance Paris Vendome Hotel, guests and locals alike are savoring ongoing exhibits complemented by custom cocktails and bites. And while the museums can boast timeless masterpieces, they can't match the kind of access afforded by the hotel. After all, guests can actually meet the artists behind the exhibits at this property. In partnership with Art Actuel, this boutique hotel in downtown Paris hosts the RLife event every first and third Thursday of the month. While the artwork remains on display for two weeks, the debut event is a one–time chance to experience the art in all of its dimensions. While the vernissage is unique among five–star luxury hotels in Paris, the property's diverse representation of artists is even more dynamic. Visitors may view the avant–garde pieces by Faz alongside the photography of Christophe Keime, for example, or the bold paintings of Wong Wa next do Leo Caillard's photographs. Designed to inspire, each RLife event draws on Paris' rich cultural landscape to provide an intimate encounter with today's artists. These RLife events reflect the property's greater commitment to discovering the side of Paris only locals know about. From its personalized, insider recommendations for things to do and see (courtesy of the R Navigator), to its authentic French cuisine at Le Pinxo restaurant, to its exciting range of amenities like a full–service spa and luxurious guest rooms, this is one hotel where masterpieces are created in hospitality every day. A distinctive choice among Paris 5–star luxury hotels, the Renaissance Paris Vendome Hotel welcomes travelers with luxurious accommodations, world–class cuisine and a location just steps away from all the best sights, including the Louvre and Orsay museums. Before guests explore the surrounding area, however, they can take stock of the hotel's considerable attractions. Guest rooms, for example, include flat–screen LCD televisions, marble bathrooms and plush bedding, while the hotel's Vendome SPA by Asian Villa offers extensive facilities and a full range of treatments. When guests want to taste the best of Paris, the celebrated Le Pinxo restaurant, helmed by Michelin–starred chef Alain Dutournier, is on property and ready to inspire palates with dishes hailing from the South of France. A fitness center, indoor spa and sauna are also available to guests, while one meeting room with 258 square feet of space ensures every gathering is both stylish and memorable. BANGKOK, THAILAND—(Marketwired – Dec 15, 2014) – As the winner of the 2014 TripAdvisor Traveler's Choice Award for “Best Family Hotel,” Mayfair, Bangkok – Marriott Executive Apartments is living up to that distinction this holiday season. Providing families with a full–equipped kitchen and separate living and sleeping areas, these Bangkok serviced apartments allow all the comfort and convenience of home, but with help from Mayfair, Bangkok's attentive staff. 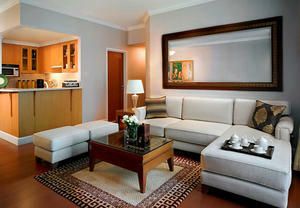 Families are invited to enjoy the value of the Family Package at Mayfair, Bangkok – Marriott Executive Apartments. The package includes accommodation in one of the hotel's 100 square–meter two–bedroom suites, in–room high–speed internet access, Complimentary breakfast buffet each morning for up to four people — if the kids are under 12, they eat free when accompanied by parents. Room rates for this hotel in downtown Bangkok start at THB 6,500++ with a minimum two consecutive night stay; use promo code ZJ6. Guests can capitalize on this exciting offer through June 2015, and are advised that booking is fully prepaid and non–refundable. Families that recognize there's no better way to usher in the New Year than travelling, experiencing something new, or revisiting something familiar with loved ones will be making the most of Mayfair, Bangkok – Marriott Executive Apartments. The city's biggest Christmas and New Year's celebrations are hosted at Central World Plaza. Guests won't miss any of the festivities with the Plaza located just 1.2 kilometers from their Bangkok extended stay hotel. Bangkok Countdown 2015 will be taking place at Central World Plaza, where families can enjoy an evening full of live performances and one of the world's most dazzling fireworks displays announcing the New Year. While waiting for these thrilling celebrations, families will appreciate the location of their hotel in Bangkok's shopping district — Siam Square. Convenient access to many of the city's most diverse shopping malls, famous restaurants, and beloved local attractions like Lumpini Park ensures that every moment of vacation can be an authentic Bangkok experience. 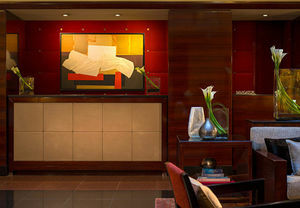 At Mayfair, Bangkok – Marriott Executive Apartments, an extended stay doesn't mean sacrificing comfort, style or service. Located in a prestigious residential area of the business district, near shopping, restaurants and markets, this hotel is a top choice for both business and leisure travelers. Elegant one–, two– and three–bedroom apartments offer a dedicated office area, safe, large LCD TV, DVD player and high–speed Internet access. Guests also enjoy the convenience of a fully equipped kitchen with grocery delivery service, daily maid service and 24–hour security. Those who'd rather leave the cooking to someone else can dine with friends or colleagues at this Bangkok hotel's Bistro M restaurant, offering all–day dining, or head to the 25th floor Bar M for cocktails and panoramic city views. Relax at the 24–hour health club, featuring a rooftop saltwater pool, spa and kids' area, or take a stroll in nearby Lumpini Park, Bangkok's first public park. With the Skytrain nearby, exploring top attractions including Erawan Shrine is easy, and those attending meetings in the hotel's boardroom can arrive without the hassle of facing traffic. CANNES, FRANCE—(Marketwired – Dec 15, 2014) – Spring and summer may be known for producing a bounty of succulent fruits and vegetables, but the JW Marriott Cannes is proving that winter harvests can be just as mouthwatering. 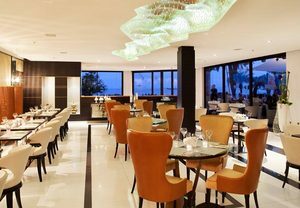 The hotel's signature restaurant, JW Grill Cannes, recently unveiled a new seasonal menu for lunch and dinner service, as well as Sunday tea. And between the Provence lamb and seasonal vegetables, the restaurant is doing more than just cementing its reputation as one of the best on the Boulevard de la Croisette. It's also making winter a foodie–friendly season. Visitors and locals eager for a taste of what Cannes has to offer in the way of fine dining will relish the JW Grill's lunch and dinner menu. Honoring the French passion for meat, the menu tempts guests with choices like a roasted double chop of Provence lamb, milk–fed Limousin veal and four different cuts of Black Angus beef from Creekstone Farms in the U.S.
Other top selections include the Croisette Burger, which is composed of chicken, mozzarella and avocado sauce, as well as the JW Beef Tartare. And while no fewer than 12 dessert options stand ready to satisfy one's sweet tooth, custom and reputation demand that guests try the legendary JW cheesecake at least once. Served with fresh berries, it enjoys pride of place at the top of the dessert menu — outranking even the homemade tiramisu, saltwater toffee millefeuille and Valrhona chocolate mousse. Unique among Cannes restaurants, the JW Grill encourages visitors to try a little bit of everything with its weekly menu offer. For EUR 30, diners can select two courses among the appetizer, entrée and dessert choices, or they can craft a three–course meal for just EUR 35. Dinner or lunch at the JW Grill Cannes is all guests need to make a return visit on Sunday for tea between 2 and 4 p.m. This age–old tradition enjoys a chic twist in the JW Grill's sophisticated dining room where, for EUR 12, patrons can choose from a selection of teas, coffees, hot chocolate and Champagne before exploring the array of homemade pastries on offer. Between a proper dinner and traditional tea, the JW Marriott Cannes is putting its JW Grill at the top of visitors' must–try list of restaurants in Cannes. And, along the way, it's also reinventing the city as a culinary destination that's always in season. Enviably situated on the former site of the Palais des Festivals just steps from the sparkling beach, the JW Marriott Cannes provides the perfect welcome to this legendary city. Guests can work and play at this 5–star luxury hotel with ease, thanks to features like the rooftop swimming pool and terrace, three dining venues and more than 26,000 square feet of event space that includes 16 newly renovated conference rooms and a 820–person auditorium. Guest rooms and suites further distinguish the property from other beachfront hotels in Cannes with balconies that capture beachfront views, luxury bedding, LCD televisions and high–speed Internet access for a stay that is as productive as it is glamorous. SAN FRANCISCO, CA—(Marketwired – Dec 15, 2014) – InsideView, the most accurate source of market intelligence, today announced its ranking as a Sales Intelligence product leader on the G2 Crowd Grid in areas considered critical to most customers. According to G2 Crowd's ranking methodology, Grid leaders offer Sales Intelligence products that are rated highly by G2 Crowd users and have substantial scale, market share, and global support and service resources. G2 Crowd's report stated that customers gave the highest product ratings to InsideView's integration to CRM and marketing automation systems, performance and reliability, and search capabilities. Overall, every single InsideView product attribute measured by G2 Crowd was rated above average. InsideView also scored high on customer engagement and implementation, receiving 90 percent or better ratings for ease of use, ease of doing business, and ease of administration. And, proving that more professionals use InsideView than competing vendors, InsideView led the entire pack of Sales Intelligence providers in “users purchased per customer,” at nearly double that of the next–best vendor. The Grid(SM), G2 Crowd's software recommendation engine, factors in customer satisfaction reported by users and vendor market presence determined from social and public data to rank products, helping businesses select the best software. G2 Crowd provides a trusted resource for the enterprise technology community by authenticating its users and validating their contributions to ensure that reviews submitted reflect authentic feedback from real software users. G2 Crowd's founders, during their 15 years in the enterprise software industry, saw the shortcomings and inefficiency in the software selection process, which relies primarily on business users slogging through vendor spin, industry–sponsored white papers, and dated analyst reports. Individuals interested in reading the full G2 Crowd Sales Intelligence Grid may visit https://www.g2crowd.com/categories/sales–intelligence. G2 Crowd is business software reviews and ratings to drive better purchasing decisions. Technology buyers, investors, and analysts use the site to compare and select the best software based on peer reviews and synthesized social data. Co–founded by the founder and former executives from SaaS leader BigMachines and backed by $4 million in capital, G2 Crowd aims to bring authenticity and transparency to business technology research. For more information, go to G2Crowd.com. InsideView provides market intelligence to inform the entire enterprise, drive marketing effectiveness and deliver sales results. We help you find better leads, win more deals and maintain and grow your customers. Our data, insights, and connections — pulled from over 30,000 sources — make every business conversation more relevant, valuable and productive. Our solutions are used by more than 450,000 sales, marketing and other professionals in over 19,000 market–leading companies including Adobe, Rosetta Stone, Box, and Zuora. For more information, follow @InsideView on Twitter, read the InsideView Blog, visit www.insideview.com, or stop by our headquarters in San Francisco, California. Grid Velocity: InsideView's satisfaction score increased by 42 points (98%) and its market presence increased by 22 points (49%). SUNNYVALE, CA—(Marketwired – Dec 15, 2014) – AMD (NYSE: AMD) today announced James A. Clifford (69) has joined the company as senior vice president of Global Operations, reporting to President and CEO Dr. Lisa Su. Clifford will be responsible for overseeing all aspects of AMD's end–to–end manufacturing and supply chain strategy. With more than 25 years of technology industry experience, Clifford brings a unique blend of end–to–end operational knowledge from supply chain to design enablement, quality, procurement, business management, and engineering to the role. 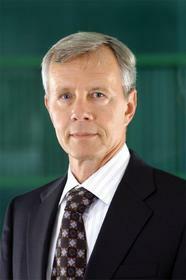 He joins AMD from RF Micro Devices, Inc., where he served as vice president of global sourcing and foundry technology. He previously spent more than 17 years at Qualcomm Incorporated in numerous leadership roles, including senior vice president and general manager of operations, as well as senior vice president of Qualcomm CDMA Technology. Before Qualcomm, Clifford spent more than 20 years at Unisys Corporation in a variety of roles that culminated in leading the company's global sourcing and foundry operations. Clifford has a Bachelor of Science in physics from San Diego State University. He is based in Austin, Texas. LOS ANGELES, CA—(Marketwired – Dec 15, 2014) – AUTRIS (OTCQB: AUTR), a manufacturer and distributor of nitrogen generators and compressed gas heaters, through its wholly owned subsidiary, NITROHEAT, has engaged Market Force IR, a national investor relations firm, to raise its visibility, strengthen its relationships with the investment community and provide strategic corporate development advisory. “Over the past year, we have restructured and repositioned AUTRIS for growth and expansion in the Automotive Collision business. We are now in the position to initiate and continue a focused IR campaign to increase awareness of the public company as well as develop growth potential for our shareholders,” said Derek Naidoo, president of AUTRIS. Through the acquisition of NITROHEAT, AUTRIS has entrenched itself in the automotive collision industry. This multi billion dollar industry is highly stable and will continue to be so as long as there are vehicles on our roads. AUTRIS, together with NITROHEAT, has the expertise and the team to develop this into a significant and profitable enterprise. Market Force IR is a full service investor relations and capital market advisory firm that utilizes a variety of innovative methods to improve investor communication, create investor awareness and expand investor reach. AUTRIS is an OTC publicly traded company. We are a dedicated automotive technology investment company with a current wholly owned subsidiary NITROHEAT (www.nitroheat.com). The company is strategically positioned for additional acquisitions in the automotive and technology sectors. Our focus is to continue the development and growth of NITROHEAT whilst exploring additional opportunities related to nitrogen generator and compressed gas technologies. The statements contained herein may include statements of future expectations and other forward–looking statements that are based on management's current views and assumptions and involve known and unknown risks and uncertainties that could cause actual results, performance or events to differ materially from those expressed or implied in such statements. In addition to statements which are forward–looking by reason of context, the words “may”, “will”, “should”, “expects”, “plans”, “intends”, “anticipates”, “believes”, “estimates”, “predicts”, “potential”, or “continue” and similar expressions identify forward–looking statements. Actual results, performance or events may differ materially from those in such statements due to, without limitation, (i) general economic conditions, including in particular economic conditions in the AUTRIS core business and core markets, (ii) performance of financial markets, including emerging markets, and including market volatility, liquidity. Many of these factors may be more likely to occur, or more pronounced, as a result of terrorist activities and their consequences. The matters discussed herein may also be affected by risks and uncertainties described from time to time in AUTRIS filings with the U.S. Securities and Exchange Commission. The company assumes no obligation to update any forward–looking statement. Small business owners, accountants and bookkeepers struggling to get the insights they need from their financial data will find relief in the latest version of Xero (@Xero) — the world's leading cloud accounting platform. Xero's newest release offers an updated accounting dashboard with a new look and feel that makes it easier for business owners to get a clear view of their financial performance, putting them in better control of key business metrics. It also offers a host of new automated features that help business owners get more time back by eliminating once mundane, time–consuming tasks. In 2014, Xero users have received over 400 free new features and enhancements as part of a nearly daily cadence of “silent” updates. “The beauty of Xero is that it makes it simple and easy to stay in control — and the more you use it, the more time you get back,” said Rod Drury, CEO, Xero. Ease of use is already seen as one of the most significant strengths by Xero users. Over 80 percent of users ranked the software's ease of use as a key differentiator compared to competing solutions in a global survey* of over 3,000 Xero accounting partners and small businesses. Get critical insights with Xero's fresh, updated dashboard: Users can gain a clear financial picture at a glance through dashboards that are easily personalized and prioritized — leading to smart, timely business decisions. This refresh paves the way for Xero's upcoming Business Performance Dashboard with big data insights for small businesses due out in early 2015. Watch the video and read the Xero blog about Xero's updated dashboard. See the details by drilling down into key reports: Built on Xero's new reporting framework, it's now possible to click to view the detailed numbers in key reports such as Profit & Loss and Balance Sheet. This includes the Account Transactions report, which provides additional columns and groupings including Gross, Tax and Net. Save time with repeating journals: It's now possible for business owners as well as their accountant advisors to create repeating journals. This saves you time by apportioning costs such as business insurance throughout the year eliminating the need to manually enter the cost multiple times. In addition, keep your manual journals organized with new bulk actions and archive capabilities. 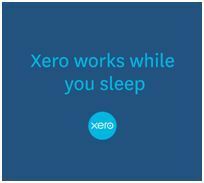 Watch the video and read the Xero blog on how Xero works while you sleep. Gain efficiency with dynamic date placeholders: Repeating invoices are ideal for paying or receiving recurring payments of the same amount for items like rent, insurance or subscriptions. Once the invoice details and frequency are defined, Xero takes care of the rest. Owners can define dynamic placeholders that refer to the invoice or bill date — which eliminates the need to do it manually each time an invoice is sent. Xero's latest release is backed with comprehensive free training and education at Xero U — an online resource with personalized, self–paced education for accounting professionals and small businesses. Share today's news: New @Xero cloud #accounting update gives #smallbiz key insights, more time back: http://ow.ly/FS6d7, http://ow.ly/FSfjs. Xero on social: Follow and share the latest Xero news on Twitter (@Xero, #Xero), LinkedIn and Facebook. Xero blog: Read about Xero news and product details. Xero reviewer's guide: Learn about Xero's key features and how they help small businesses be successful. Xero is beautiful, easy–to–use online accounting software for small businesses and their advisors. The company has 400,000 paying customers in more than 180 countries. Xero seamlessly integrates with over 350 third–party tools, and was recently ranked No. 1 by Forbes as the World's Most Innovative Growth Company. *The results of this study were taken from a random global sample of over 3,000 Xero customers based in Australia, New Zealand, the United States and the United Kingdom. The research was commissioned by Xero and independently conducted by market research company, Perceptive Research. MCLEAN, VA—(Marketwired – Dec 15, 2014) – Three agencies recently reaffirmed their ratings that demonstrate the depth and strength of Freddie Mac (OTCQB: FMCC) Multifamily's asset management and operations. “These rankings demonstrate our strong operational capabilities and continued commitment to providing a best in class servicing standard for the Freddie Mac Multifamily business,” said Michael Lipson, Multifamily asset management and operations senior vice president. Fitch Ratings affirmed the Commercial Master Servicer CMS2 and Commercial Special Servicer CSS2– ratings that reflect Freddie Mac's ability to service and work out loans backed by apartment buildings with five or more units. Morningstar Credit Ratings, LLC affirmed the MOR CS2 commercial mortgage special servicer ranking and MOR TA3 commercial mortgage trust advisor ranking for Freddie Mac. These rankings reflect the quality of the Freddie Mac Multifamily asset management, operations, staff expertise, timely reporting and asset resolution practices, as well as the business's ability to monitor the information provided by servicers. Standard & Poor's Ratings Services affirmed its overall ABOVE AVERAGE ranking on Freddie Mac as a commercial loan master servicer. The ranking reflects the quality of the Multifamily management team, effective training, audit and technology systems, and comprehensive servicer oversight program. The Multifamily asset management and operations division is responsible for servicing the whole loan–guaranteed securities, tax–exempt bonds and other multifamily product lines, as well as servicing multifamily debt investments. As of September 30, 2014, Freddie Mac had a multifamily whole loan portfolio of $51.7 billion, a multifamily investment securities portfolio of $25.8 billion, and a multifamily guarantee portfolio of $84.4 billion.